What is the TIGER Program? 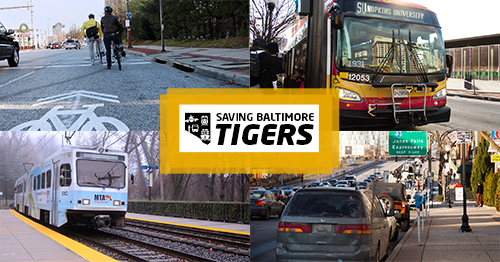 The Transportation Investment Generating Economic Recovery (TIGER) discretionary federal grant program supports innovative multi-modal and multi-jurisdictional infrastructure projects that seek to improve access to reliable, safe, and affordable transportation and spur economic development. Since its creation in 2009, the TIGER program has provided over $5 billion to over 400 projects in all 50 states, the District of Columbia and Puerto Rico. Unfortunately, with federal transportation funding stuck at flat levels, demand for the 2016 TIGER grant program continued to far exceed available funds. The Department of Transportation (DOT) has had to turn away billions worth of shovel ready projects since the program’s inception. Learn more about the DOT administered program here. In 2016, DOT awarded the North Avenue Rising project $10,000,000 to fund roadway, signal, and sidewalk improvements along North Avenue, as well as to improve transit options through subway station, bus/bike lane, and light rail improvements. North Avenue is a major east-west corridor in Baltimore city, the second busiest bus corridor in the city, and connects key employment centers to as lower income neighborhoods. In 2015, DOT awarded the Southeast Baltimore Port Industry Freight Corridor Plan project $10,000,000 to enhance freight services from the Port of Baltimore and restore Colgate Creek Bridge to functionality. “This infrastructure is critically necessary to preserve and enhance the economic security of the Port of Baltimore more while positioning Baltimore City, The Port of Baltimore, and private partners to meet economic, employment, mobility, housing, and sustainability challenges faced by the City’s residents.” Baltimore City Department of Transportation. TIGER funded a portion of the now completed Takoma-Langley Transit Center project ,which enhanced transit bus access and mitigated pedestrian safety issues at one of the region’s busiest intersections – MD 650-MD 193. The Howard Street Tunnel: A private public project to allow double-stacking of CSX freight trains through the City of Baltimore. Baltimore is the only point on CSX’s east coast network that prevents double stacking. Amtrak has named the Baltimore & Potomac Tunnel project, which prevents full high-speed rail travel on the Northeast Corridor (NEC) due to its extreme curvature, a top-ten unfunded priority and has identified TIGER as a possible federal funding source. The Port Covington project lost a FASTLANE grant in 2016 and may seek TIGER funding for its light rail spur and I-95 ramp reconfiguration in the future. Urge Congress to Fund our TIGERs!